This paper sets out to describe some of the forces at work in the period 1870 to 1900 which helped create rural Manitoba of today. I would like to deal with this topic under three main headings: Transportation and Settlement, 1870 - 1880; The Railway Era, 1881 - 1891; and Settlement Follows Railways, 1891 - 1900. First, however, I will discuss the system of land division which was a prerequisite to any activity in settlement. Three systems of land survey are in common use in the agricultural portion of Manitoba. The parish or the river lot system of survey, though revised from time to time, is still in effect in the areas of early settlement. These extend from near Lake Winnipeg on either side of the Red River as far south as Emerson, west along the Assiniboine River to approximately four miles southwest of Portage la Prairie and in other isolated portions of the province on river or lake frontages. The river lot system was modelled after the survey used in Lower Canada. This served the settlers who, besides working for the Hudson's Bay Company and supplying it with farm produce, were also engaged in fishing, hunting and trading. The river at their front door represented something more than a convenient base for surveys, it was also an essential element of the settlement and the survey was oriented towards it. The second system of survey was devised by Colonel J. S. Dennis, an Ontario Provincial Land Surveyor. He made little use of the long narrow lot survey of that province; rather the American survey scheme, with some alterations, was used as a prototype for the prairie survey. The proposed system was to consist of townships of sixty-four squares of eight hundred acres each and to contain, in addition, five per cent of the area in each section as an allowance for public roads. This scheme was modified when field survey work was interrupted by the Riel Uprising of 1869-70. The townships were changed to contain only thirty-six sections each approximately one mile square with a road allowance one and one-half chains wide. It was felt that townships in the original system were too large and that immigrants would be more familiar with the latter. Thus the townships measured six miles on each side, plus the road allowances. This system covers most of Southern Manitoba (south of Township 27) and extends into Eastern Saskatchewan. In 1881 this system was modified making the road allowances one chain wide and placing them on each alternate east and west line, though retaining them on all north and south lines. This revision was introduced to increase the amount of land allotted for cultivation and to decrease the cost of the survey. Thus, a large area of the province was surveyed using a "system which had for its primary consideration, the rapid and accurate division of the prairie region into farm holdings." The survey proceeded well ahead of settlement as it rapidly superimposed a rigid stereotyped pattern without any regard to the physical characteristics of the land. No attempt was made to conform to topography, soils, drainage, and vegetation, and this system has been criticized by rural sociologists for the isolated life which it induced. With the completion of the survey in the Red River Valley and the western highlands, the first prerequisite to settlement was an accomplished fact. Law and order was provided by the Legislature of the province and by the North West Mounted Police. A succession of treaties with the Indians placed them on reservations as wards of the Queen. Certain lands were designated as halfbreed reserves which subsequently were changed to halfbreed scrip lands. The lands not affected by pre-1870 claims and not designated as reserves were available for homesteading, outright sale, or as grants to railways. The Canadian Pacific Railway alone received a total grant of twenty-five million acres of land. Approximately two sections in every township were set aside for the Hudson's Bay Company for one-twentieth of the fertile belt south of the North Saskatchewan River was the company's reservation. Two sections in every township were designated as school lands. In 1872 the Federal Government passed an "Act Concerning the Public Lands of the Dominion" whereby any person twenty-one years of age or over could apply for a homestead right to 160 acres of Dominion land. Title to the property was granted at the expiration of three years, provided the homesteader had resided on the property and made specified improvements. With respect to incoming settlers, it was suggested that a prospective homesteader contact the agent at the Land Registry Office and have him arrange with his "Land Guide" to locate the vacant sections and to give information regarding the quality of the soil, the presence of water, and the availability of wood and hay lands. 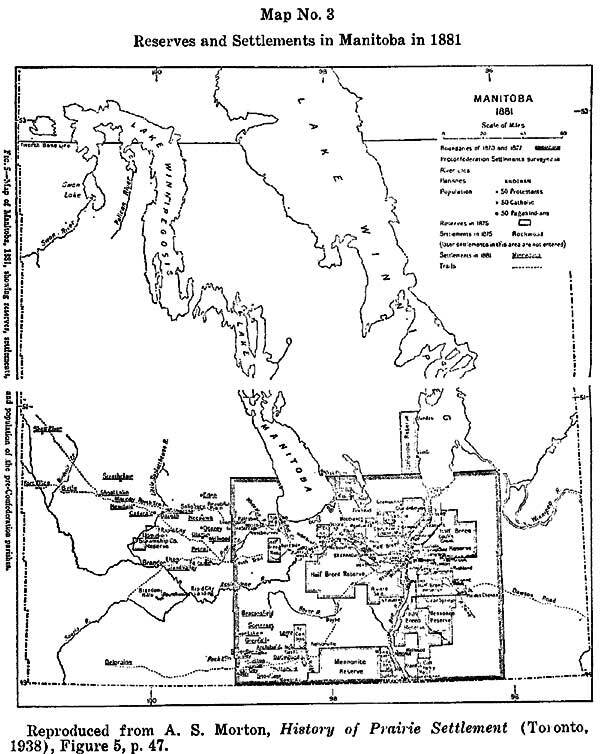 Prospective settlers entering Manitoba before 1878 followed three main routes: the Hudson Bay-Lake Winnipeg route; the Dawson route via Lake of the Woods and the Great Lakes; and the United States route by railroad to Moorehead and by steamboat on the Red River to Emerson or Winnipeg. In 1878 Winnipeg was connected to the American railway system via Emerson thus removing a very serious obstacle to immigration. Emerson and Winnipeg developed into the two main dispersal points for settlers. The Pembina Hills area had two lines of approach: one, via the International Boundary Commission Trail, and the other, by way of the trail to the Missouri River from Headingly. The move westward from Winnipeg was along the north and south branches of the Saskatchewan trail. The settlers found their way to their homesteads on the plains by following trails which were in use right up to the time railways superseded them. During the years from 1876 to 1881, excessive spring rain made movement over the trails extremely difficult, and this tended to encourage navigation on the Assiniboine River. In 1876, the "Prince Rupert" displaced the stagecoach between Winnipeg and Portage. In 1879, and again the following year, the "Marquette" made the voyage through the sand hills past the Grand Rapids, eight miles above the mouth of the Souris, to Fort Ellice. A converging of these factors, that is, technological advances in farming on the prairie type of environment together with the exhaustion of the better land in the United States and Ontario and improved transportation facilities, was ultimately to inaugurate a new era in the Canadian West. By 1871 Manitoba had been well advertised in Ontario and those who undertook the difficult and slow move to the Red River began to occupy the prairie and parklands in the Stonewall, Prairie Grove and Springfield areas. In the following three years, new settlements grew steadily; however, very few settlers were willing to homestead on the open prairie, much of it being barren of both wood and running water. The settlement around Emerson became the dispersal point for settlers pushing west and some east along the International Boundary Commission trail. Trails from the Kildonans towards Shoal Lake gave rise to settlements such as Grassmere, Argyle and Woodlands. Immigrants followed the north branch of the Saskatchewan trail and established the Westbourne, Woodside, Palestine, and Livingstone settlements. To the southwest, Boyrre and Nelsonville settlements sprang up. Settlement was checked by a severe plague of grasshoppers in 1876. When immigration increased in 1877, its distribution was affected by a succession of spring having high precipitation. Settlers discovered that south of the Assiniboine River the lands above the escarpment were as fertile as, and better drained than, those in the valley and that this area provided a considerable growth of wood. This gave rise to settlements such as Darlingford, Somerset, Snowflake, Beaconsfield, Crystal City, Clearwater and Swan Lake. The traffic along the Assiniboine River untied attention to the lands adjacent to the valley. From points of debarkation along the river settlers proceeded to tile Rapid City area, to the area surrounding the Brandon Hills, as well as to Odanah, Minnedosa and Birtle. 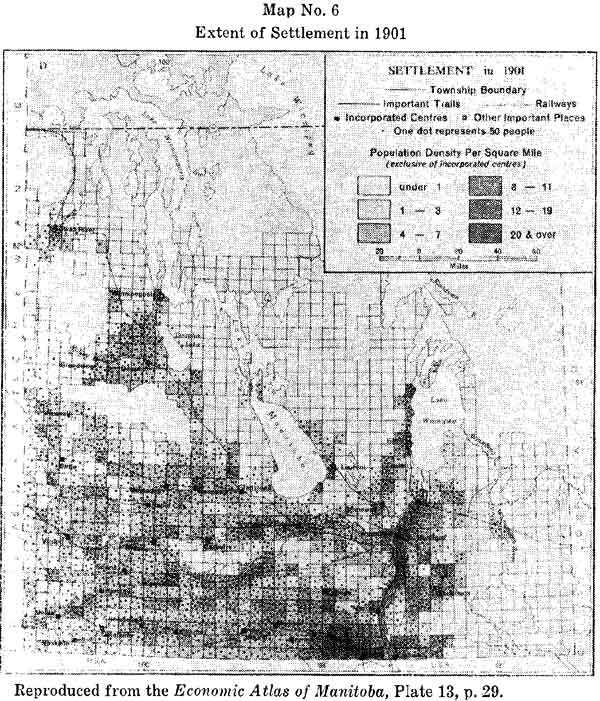 By 1881 settlements in more or less direct relation to the North or South Saskatchewan trails appeared, giving rise to Wellwood, Oberon, Osprey, Neepawa and Eden. In the years 1874 and 1875, group settlement was begun; for in these years the Federal Government, by Order-in-Council, set aside blocks of land on which group colonists homesteaded. The first group settlers were the French from Quebec and Massachusetts who took up land in reserves in the Letellier, St. Pierre-Jolys and St. Malo areas, as well as in the old settlements of Ste. Anne-des-Chenes, Ile-dies-Chenes and the reserves set aside for the "metis". The first Mennonites came to Manitoba in 1874 and settled in the "East Reserve" located north and east of the Rat River. A second reserve was established west of the Red River, along the border towards the Pembina Mountains, in 1876. These two areas were set aside for the sole use of the Mennonite settlers. This was the first major demonstration of settlement on the open plain removed from wooded areas. In these two reserves, they superimposed upon the sectional survey, the pattern of the agricultural village carried forward from Russia. During this period, a reservation of more than six townships was set apart for a colony of Icelanders. The reserve extended for thirty miles along the west shore of Lake Winnipeg, with Gimli as its center. According to A. S. Morton and James Trow, the system of reservations tended to retard settlement. 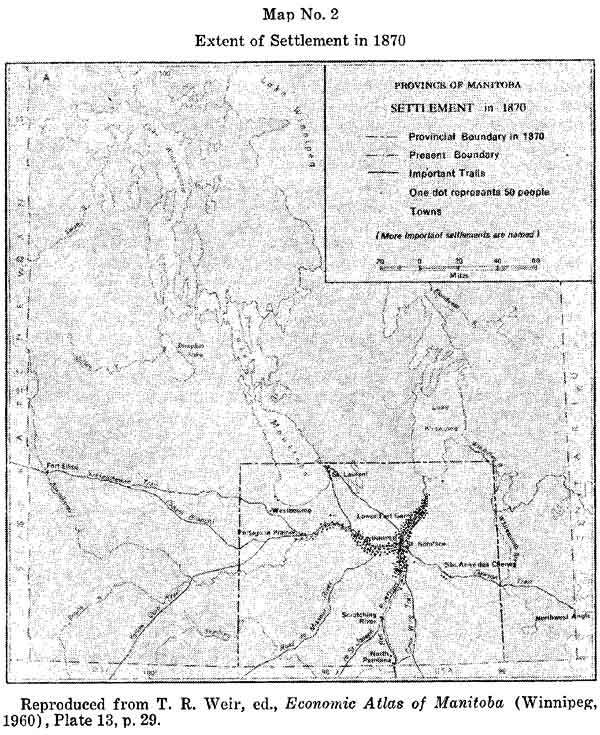 Trow claimed that many of the reservations (including railway reserves, Hudson's Bay Lands, Indian reserves and School Lands) were not in the interest of the Province and would retard legitimate colonization, unless thrown open for settlement. These reserves together with the holding of land by speculators, created a "landlock" which was vigorously denounced. This factor, plus flooding, caused by heavy precipitation during 1877, encouraged settlers to push beyond the escarpment and the Assiniboine delta. Until the eighties, Manitoba was largely the market for its own agricultural products, but, beginning in 1877 a small amount of wheat was being shipped east by steam boat. In the main, however, settlement up to this time had been a speculative venture in anticipation of the railway. In 1881, the Trans-Continental Railroad reached Brandon and during the same year, by an Act of Parliament, the boundary of the province was changed on the west to its present boundary and on the north to 53' of latitude. Settlement in the 1870s followed trails leading in different directions and when the Canadian Pacific reached Brandon in 1881, its single line running across the province was already inadequate. This was borne out by the various charters granted by the province for the construction of additional lines. The C.P.R., according to Clause 15 of the Canadian Pacific Act, had a practical monopoly to build rail lines on the lands south of their Trans-Continental line. This right was disputed by the province, however, and several charters passed by the Manitoba Legislature were disallowed by the Dominion as conflicting with Clause 15. This clause was cancelled in 1888. During the decade of the 1880s, the Manitoba North Western Railway was built as a feeder from Portage to Gladstone, Minnedosa, Birtle and into the N.W. Territories. The C.P.R. continued westward from their Winnipeg-Gretna line (1882) at Rosenfeld to Manitou and Deloraine (1886), by-passing the village of Nelsonville by five miles. Another line from Winnipeg to Brandon was commenced by the Manitoba and South Western Co. as far as Elm Creek. The C.P.R. bought out its charter and continued the line through Glenboro to Brandon. In 1889, the Northern Pacific and Manitoba Railway Co. built a line from Morris to Greenway and to Brandon which gave rise to the towns of Miami, Somerset and Wawanesa. According to studies carried out, it was generally agreed that the distance within which producers could economically haul their grain to market was in the vicinity of ten miles, although some farmers were known to haul their produce a distance of fifty miles. The distance and cost of grain movement to the shipping point depended on the alternative uses to which the farmer's time and equipment might be put. This left many a farmer beyond the economic limit for grain transportation. 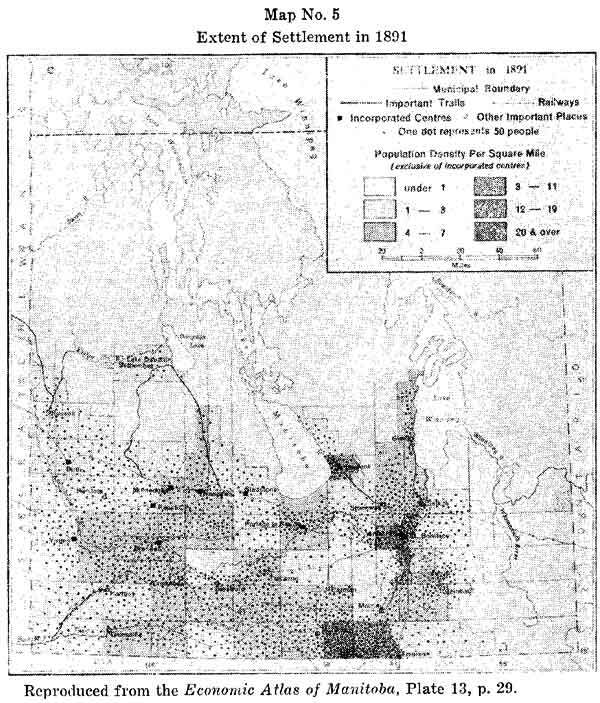 In 1885 it was reported that there was a "great want of railway facilities" especially in the counties of Turtle Mountain, Souris River, Shoal Lake, Russell, Rock Lake. This acute shortage resulted in homesteads being abandoned and prepared land left unseeded. During the years 1882 to 1887, immigration was at a low ebb. These were years of depression, of severe frost damage to crops, and of drought. It was during 1883 that the duties on agricultural implements were substantially increased. It was during this period also that methods of dry farming were adopted and that earlier maturing varieties of wheat, notably Red Fife, were being developed. Even though the frontier of settlement had moved westward beyond Manitoba during the 1880s, there remained areas of empty land in the southern portion of the Province. There was the scantily settled wet lands between Morris and Carman, and the sandy lands along Middle Assiniboine. The largest area of relatively unoccupied land was in the southeast where poor soils and poor drainage effectively retarded settlement. The rough and wooded lands in the vicinity of Turtle Mountain and Riding Mountain discouraged settlement in that area, and much filling in of settlement remained to be done in districts already occupied. By 1890, the rapid railway construction of the past decade had come to a pause. 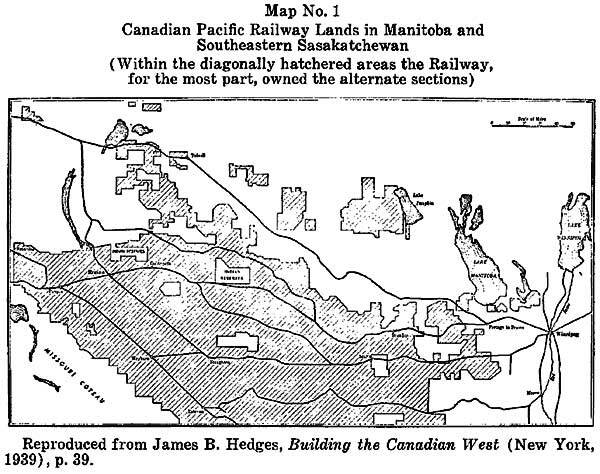 The basic pattern of the railway network was laid with Winnipeg emerging as the nodal point for goods and people moved by rail. During the latter part of this decade, however, two major railway lines were added to the network, as well as some minor branch lines and extensions. During 1896, Mackenzie and Mann commenced construction on a line from Gladstone to the Dauphin area. With the completion of this line, Manitoba had gained a new booming frontier to the northwest. To the north of this new frontier lay the country of the Swan River Valley which was reached by the rail line in 1899. Dauphin was used as a base for settlers moving into this valley. The same two energetic railway projectors constructed another line from St. Boniface to Marchand. This project was begun in 1898 and reached Fort Frances in 1901. It passed through the forested lands of the southeast that by and large were too sandy or too poorly drained for agricultural use. During the first half of this decade there was a slackening of the inflow of immigrants. The reasons for this decline seem to have been related to the subnormal precipitation from 1886 to 1897 (excluding 1887), to the fact that most of the good land south of the Riding Mountains had either been taken up by actual settlers or was being held by speculators, and to the depressed economic situation which resulted when the price of new land was comparatively high relative to the low produce prices. Settlement in the Dauphin area began in 1886 with settlers coming in from the west. Settlement in this fertile frontier area, where first quality land was cheap, had passed beyond the railway. By 1888 settlers were following the Arden Ridge up into this fertile district and with the increase in settlement and in crop surpluses, there grew the need for communication with the outside world. With a means of communication established, the best lands in this area, as well as in the Swan River district, were soon occupied. This area was settled largely by Canadians or Anglo-Saxons, and for many of them this was a second frontier, as they had already sold their original improved homesteads at high prices. With the settling of these two frontiers the last of the better agricultural land was occupied. This left untouched the marginal lands which demanded a greater investment for their development and promised lower returns than any of the lands hitherto settled. These lands, extending from southeastern Manitoba through the Interlake area and past Dauphin as well as land adjacent to Riding Mountain Park and Duck Mountain Forest Reserve, had been avoided by earlier immigrants. The major part of the task of settling the bush country was left to the Slavic people who began to migrate to Manitoba during 1896 when most of the good land had already been settled. At the threshold of the twentieth century the basic pattern of railway transportation was almost complete. Manitoba during the past 30 years had developed pretty well into a grain-growing province; the growing and shipping of wheat were its two main occupations. With the immigration of the settlers from eastern Europe during the turn of the century the province increasingly turned into a polyglot mosaic of diverse people. And in many cases the various ethnic groups settled in definite zones or in reserves set aside for a particular group. 1. 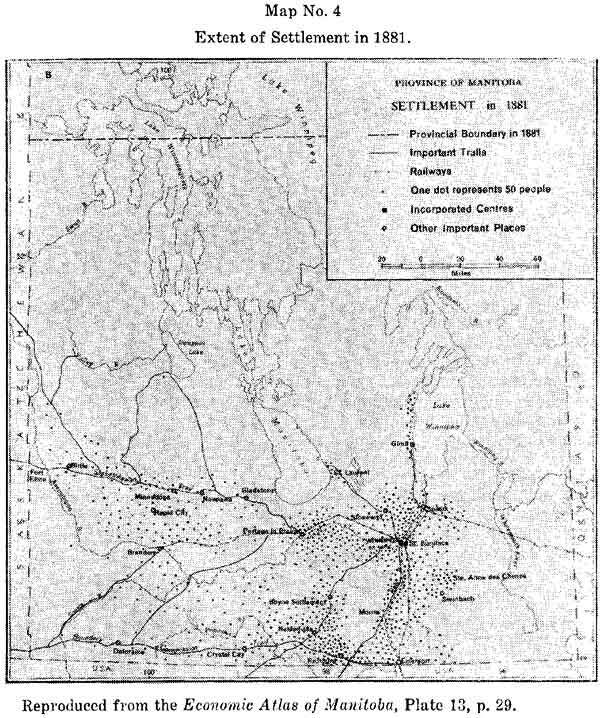 John Warkentin, "Manitoba Settlement Patterns," Papers Read Before the Historical and Scientific Society of Manitoba, Series III, No. 17, pp. 62-64. 2. Canada, "Report of the Department of the Interior, 1892", Sessional Papers, XXV, No. 13. 3. Thomas Adams, Rural Planning and Development (Ottawa, 1917), p. 59. 4. Ibid., p. 62. There were 54 miles of roadway reserved to service one township and the alternate scheme proposed by the Commission reduced this to approximately 40 miles. 6. Quoted from F. H. Peters in L. Z. Rosseau, "Surveys and Land-Use Planning in the Province of Quebec," Proceedings of Thirty-fourth Annual Meeting of the Canadian Institute of Surveying, 1941, p. 31. 7. H. E. Beresford, "Early Surveys in Manitoba," Papers Read Before the Historical and Scientific Society of Manitoba, Series III, No. 9, p. 12. 8. In a region where summer fallowing was to become a conspicuous form of land use this provision to acquire a second quarter had something to recommend it. 9. The settler would mortgage his homestead quarter. All too often he would lose both his preempted and the homestead quarter. 10. R. W. Murchie and H. C. Grant, Unused Lands of Manitoba, Manitoba Department of Agriculture and Immigration (Winnipeg, 1926), p. 60. 11. To counteract this speculation the provincial government, in 1886, stipulated that farms should be assessed for taxation purposes as if they were in their unimproved state. 12. The all-Canadian Dawson route was a combination of trails and steam launches. Railroad connection to Moorehead from St. Paul was made in 1870. 13. Manitoba Crop Bulletin, No. 6, Department of Agriculture, Statistics and Health (1884), p. 15. 14. A. S. Morton, History of Prairie Settlement (Toronto, 1938), p. 84; H. G. L. Strange, A Short History of Prairie Agriculture, (Winnipeg, 1964), p. 27. 15. William L. Morton, Manitoba: A History (Toronto, 1957), p. 158. 16. Morton, History of Prairie Settlement, p. 56; James Trow, Manitoba and the Northwest Territories, Department of Agriculture (Ottawa, 1878), p. 17. 17. William L. Morton, Manitoba: A History, (Toronto, 1957), pp. 209 ff. 18. Manitoba Crop Bulletin, No. 10, Department of Agriculture, Statistics and Health (June, 1885), pp. 18-19. 19. Prior to the advent of the modern grain elevator flat warehouses were used for grain handling. The first elevator was built in 1879 at Niverville. The first square standard elevator was built in 1881 at Gretna by the Ogilvie Milling Company. 20. Economic Atlas of Manitoba, p. 28. 21. Ora1 report from C. B. Gill, Forestry Branch, Department of Mines and Natural Resources, 1963.